Location/Climate: West coast of Baranof Island, 95 air miles south-southwest of Juneau. 94"/yr. precip., 23°F61°F. Population: 9,194 (20.9 percent native, including Tlingit, Aleut, Haida, and Eskimo). Travel Attractions: Sitka National Historic Park, Sheldon Jackson Museum, Isabel Miller Museum, Castle Hill State Historic Site, Old Sitka State Historic Park, St. Michaels Cathedral, local hiking trails, Mount Edgecumbe, Sitka Sound kayaking, wilderness access. Getting There: Scheduled air and ferry service from Juneau. Information: Sitka Visitor Center, at cruise dock on Harbor Drive, Sitka, AK 99835; Sitka Visitors and Convention Bureau, P.O. Box 1226, Sitka, AK 99835, 747-5940, www.sitka.org. When the first Russians arrived at the village of Shee-Atika in 1799, they found the Kiksadi clan of Tlingit Indians long established in the region. Together with Aleuts who were more slaves than allies, soldiers fighting for Alexander Baranov and the Russian-American Fur Trading Company drove the Tlingit from the area in 1804, established a stockade and settlement, and renamed the town "New Archangel." The town served as the capital of Russian America until Alaska was sold to the United States in 1867. Under the Russians, Sitka grew with the wealth of the fur trade, then hung on through the decline of the otter by developing shipping, fishing, milling, and ice-export industries. Today Sitka is a favorite destination in Southeast Alaska. The town has two institutions of higher education (University of Alaska SoutheastSitka campus and Sheldon Jackson College), is rich in history, and is no longer home to a major pulp mill (closed several years ago). While a popular cruise-ship destination, Sitka feels far less touristy than Skagway or Juneau. In addition, its location on Baranof Island means that glacier-capped peaks and sheltered waters are close by. Sitka is easily reached by scheduled air or ferry service from Juneau and other points. The airport is on Alice Island, also home to the small U of A campus and a short shuttle from town over the very visible bridge. The ferry terminal is 6 miles and a $5 shuttle from town on Halibut Point Roadthough you can comfortably walk to the campground at Old Sitka from the ferry dock (1 mile). The road system on Baranof is very short, so its not worth paying to bring a car over on the ferry unless its part of a larger journey. One marvelous feature of the Sitka area is the 3,200-foot, near-perfect volcanic cone of Mount Edgecumbe, 16 miles west of town across Sitka Sound on Kruzof Island. The 6-mile Mount Edgecumbe Trail climbs to the summit from the islands east shore, with a reservable cabin and additional shelter on the way. Two miles northeast of the peak is Crater Ridge, featuring a perfect, 600-foot-deep volcanic crater 1.5 miles in diameter. Sitka offers numerous attractions, most of which are easily reached on foot from the town center. Check at the visitor center, where Harbor Drive swings by the cruise dock, for information on native dance performances in Centennial Hall. Several good trails are accessible from Sitka; a couple begin right in town. Gavan Hill Trail (6 miles, 3,100' gain)From the end of Baranof Street in town, the trail climbs 4 miles through forest to the exposed ridge and summit of Gavan Hill (2,650'). From here its a 2-mile ridgewalk to Harbor Mountain (3,160'). To make a loop, continue down the Harbor Mountain Trail to the end of Harbor Mountain Road and hope for a 10-mile ride back to town. Otherwise, RTall day. Indian River Trail (5.5 miles, 700' gain)The trail begins left of the pumphouse and dam at the end of Indian River Road off of Sawmill Creek Road, just south of Sitka, about 1.3 miles from downtown. This easy route follows the river through rain forest to Indian River Falls. Rough access to the ridges above the watershed offers possible high-country routes with exposure and views. RTall day. Mount Verstovia Trail (2.5 miles, 3,300' gain)From the trailhead on Sawmill Creek Road 2 miles south of town at Rookies Bar and Grill, this route switchbacks up to the ridge-end summit of Mount Verstovia, offering great views of town and Sitka Sound. Its possible to follow the ridge inland if desired. RThalf day. Alaska Raptor Rehabilitation CenterA volunteer effort has made this the Southeasts premier raptor rescue center. Animals that cannot be released into the wild are on display to visitors. Its located on Sawmill Creek Road, just south of Indian River and the Sitka National Cemetery. Open daily in summer; hours vary so call ahead, 747-8662. Castle Hill State Historic SiteClimb the steps from Lincoln Street near the Sitka Hotel to reach this National Historical Landmark. Originally the site of a Tlingit settlement, the Russian-American Fur Trading Company built a castlelike edifice atop the hill for high officials. The structure burned in 1894. Castle Hill was the site of the official transfer of Alaska from Russia to the United States on October 18, 1867, as well as where the 49-star flag was first raised in an Alaskan statehood ceremony on July 4, 1959. The hill is now crowned with a small plaza surrounded by a low wall and guarded by historic Russian cannons. Isabel Miller MuseumHome of the Sitka Historical Society, this museum covers all aspects of the towns history from Russian, Tlingit, and American perspectives. A favorite exhibit is the scale model of Sitka in 1867. Located in the Centennial Building by the cruise dock, 747-6455. Open May 15October 1, daily 9 a.m. to 5 p.m.; winter TuesdaySaturday; $1. Old Sitka Historical Site and State ParkLocated about 7 miles north of town on Halibut Point Road, this small park has nature trails, a boat launch, and a campground. The park is on the site of the original 1799 Russian settlement. After they were driven out by the native Tlingits, the Russians fought their way back in 1804 and established the town on the current site. Pioneers HomeAnother of Sitkas landmarks, this large retirement home at the north end of Lincoln Street is fronted by a wide plaza and Totem Square. Its worth a walk-through. Russian Cemetery, Princess Maksoutov Grave, and Russian BlockhouseReached from Marine Street above Seward Street, these sites are a walk-and-look window into Sitkas Russian past. The princess was the wife of Sitkas second governor. Get a city map and guide from the visitor center to pinpoint locations and get historic details. Saint Michaels Russian Orthodox ChurchThe centerpiece of Sitka and its chief identifying structure, St. Michaels and its onion-shaped domes is unmistakable. The original church, built in 1848, burned to the ground in 1966, though many artifacts were saved and installed in an exact replica constructed in the 1970s. Lincoln Street, 747-8120. Open summer, daily 11 a.m. to 3 p.m. or at other hours to accommodate cruise ships; $2 suggested donation. Sheldon Jackson MuseumLocated on the campus of Sheldon Jackson College, this excellent museum of native heritage artifacts was built in 1897 with funds raised and donated by the Reverend Dr. Sheldon Jackson, a Presbyterian missionary and the first General Agent of Education for Alaska. The octagonal structure is modeled after a Northwest Coast native community house. 104 College Drive, 747-8981. Open daily mid-Maymid-September 9 a.m. to 5 p.m.; winter TuesdaySaturday. Sitka National CemeteryEstablished in 1867 as the first national cemetery west of the Mississippi. Sawmill Creek Road at Jeff Davis Street. Sitka Tribe of Alaska Community HouseOffers presentations of native songs and dances, as well as artwork. 200 Katlian Street, 747-7290. Stop at the gift ship for performance times. Homestead Outfitters, P.O. Box 691, Sitka, AK 99835, (800) 995-0461, 747-6765. Enjoy an affordable cabin stay on an island 10 minutes from Sitka Harbor. Cabins have kitchenettes, private baths, wood-fired saunas, and spacious decks. Lund and bareboat rentals available. Open MaySeptember. $70. Sitka Hotel, 118 Lincoln Street, 747-3288, sitkah@ptialaska.net. Nicely remodeled and well kept, this historic inn is a great choice. Rooms are $50 to $100. Sitka Youth Hostel (Hostelling International), 303 Kimsham Street, P.O. Box 2645, Sitka, AK 99835, 747-8356. Beds are $9. Tongass National Forest Campgrounds: StarrigavanOld Sitka site, 7 miles north of town, Halibut Point Road, $8. Sawmill Creek7 miles east of town, Sawmill Creek Road, no treated water, free. Westmark Shee Atika, 330 Seward Street, 747-6241, $90 to $140. 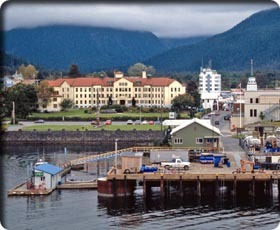 This is Sitkas hotel and the best place to get a shuttle to the ferry terminal. All the amenities. The Backdoor Cafe/Old Harbor Books, 201 Lincoln Street, 747-8808. An excellent bohemian retreat for book browsing, espresso drinks, and pastries. Ginnys Kitchen, 236 Lincoln Street, 747-8028. Good soups and sandwiches, great pies and baked goods, espresso drinks. Highliner Coffee, Seward Square Mall, across from the Westmark Hotel, 747-4924. Coffees, bagels, pastries, cookies, and more. Internet and e-mail access. Lane 7 Snack Bar, 331 Lincoln Street (at the bowling alley). Burgers, fries, and breakfast. A favorite local place for good grub. Location/Size: Main unit is at the end of Lincoln Street, G-mile east of downtown. Russian Bishop House is on Lincoln at Monastery Street, across from the cruise dock. Less than 40 acres. Main Activities: Historic tours, totem poles, shoreline walks, visitor center. Gateway Towns/Getting There: Sitka/scheduled air or ferry service. Park is accessible by a short walk from town center. Facilities, Camping, Lodging: Visitor center at main unit, Russian House, totems, Tlingit fort, footpaths. No camping or backcountry lodging. Headquarters and Information: Headquarters, P.O. Box 738, 106 Metlakatla Street, Sitka, AK 99835, 747-6281, www.nps.gov/sitk; visitor center, end of Lincoln at park entrance. Established in 1910 as Alaskas first federally designated park, Sitka National Historic Park preserves key pieces of both Tlingit and Russian history and is Sitkas top travel attraction. The park was created to commemorate the 1804 Battle of Sitka, when the Kiksadi clan of Tlingit Indians repelled an attack by Russians and Aleuts. The main unit of the park includes the battleground, the site of the Kiksadi fort held during the siege, a number of wonderful totems, a fine forest walk, a salmon stream, and a good visitor center. A smaller unit of the park preserves the marvelously restored Russian Bishops House, home and offices for Bishop Ivan Veniaminov, first Bishop of Sitka. Completed in 1842, the house served as the center of Russian ecclesiastical authority in a diocese that ranged from Fort Ross, California, to the Kamchatka Peninsula of Russia. The house is on Lincoln Street across from the boat harbor, 3 blocks from the park visitor center and across the street from the striking St. Peters Episcopal Church.